Spring is finally here and yeeeees, we are already immersed in warm days full of sun! I love this season, everything blossoms and I always feel is time to renew projects, the wardrobe, my beauty routine and introduce with new fresh make-up looks! Here are a few products that I find especially suitable for this time of the year when the make-up becomes lighter and in fresher colours. A hint of natural colour is always welcome and we all want products that are quick, easy to use and that have great ingredients. 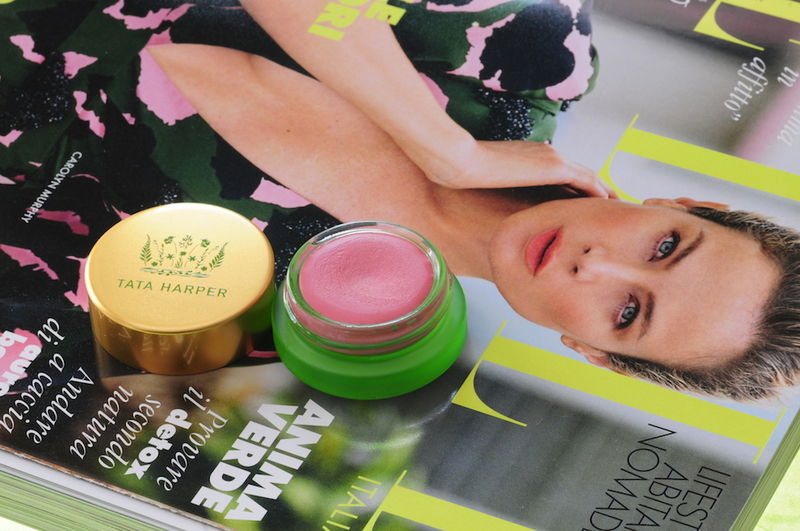 Tata Harper Volumizing Lip & Cheek Tint is the perfect product for an everyday make-up where you want to have a nice stain on your lips and perhaps add even that natural flush to the cheeks. I find perfect one of the 3 shades called Very charming, which is a nice matte antique warm rose shade that suits everyone and gives the appearance of a natural blush colour. It blends perfectly into the skin, leaving it smooth and radiant. I’m a fan of this kind of creamy make-up products, that are multi-purpose and this balm is a really nice solution if you look for a natural make-up look with great ingredients and easy to apply. There are many brands out there with similar products, but I really wanted to try this one and is completely approved! Cocos nuciferra (Coconut) Fruit Extract, Helianthus annuus (Sunflower) Seed Oil*, Ricinus Communis (Castor) Seed Oil, Cera Alba (Beeswax)*, Caprylic/Capric Triglyceride, Helianthus annuus (Sunflower) Seed wax, Natural and Organic flavors, Palmitoyl Isoleucine, Camellia sinensis (Green Tea) seed oil*, Plukenetia (Sacha Inchi) Volubilis Oil*, Euterpe oleracea (Acai) fruit oil*, Caprylic/Capric Triglyceride, Lavandula stoechas (Spanish Lavender) Extract, Tocopherol. MAY CONTAIN: Iron Oxides (CI 77499, CI 77491, CI 75409, CI 77891, CI 77492) Carmine, Jojoba Esters, Mica, Trihydroxystearin. *Ingredients from organic farming. 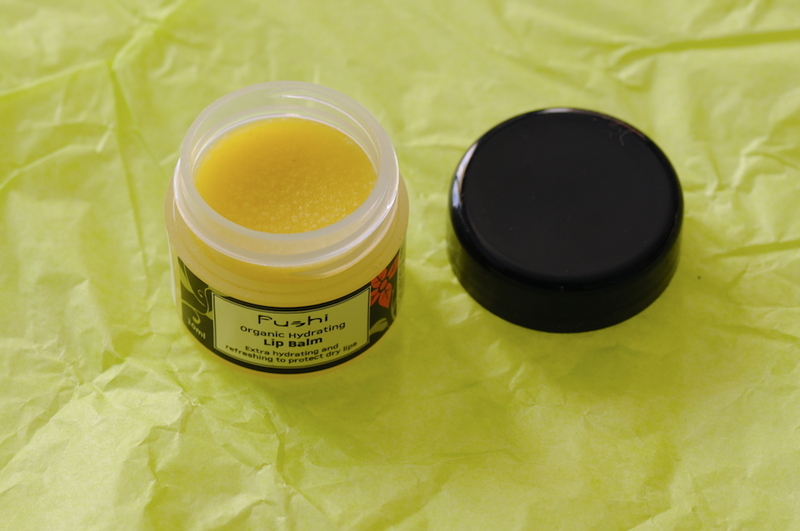 When I received the package from Naturisimo shop, I noticed that they’ve just added a new organic British brand called Fushi and they added me this lovely Fushi Organic Hydrating Lip Balm. It’s perfect for spring because of its hydrating properties as well as for its fresh cooling peppermint scent. Otherwise is full of oils like avocado, jojoba and shea butter, enhanced with natural scents from essential oils of geranium and peppermint. I saw that Fushi has many other products for entire body wellbeing; supplements and different oils so it’s a brand all to try and discover. INCI: Butyrospermum parkii (Shea butter), Persea gratissima (Avocado oil), Simmondsia chinesis(Jojoba oil), Cera alba (Beeswax), Mentha piperita (Peppermint essential oil), Pelargonium graveolens (Geranium essential oil), *Tocopheryl acetate (Vitamin E), +Limonene, +Linalool, +Citral, +Geraniol, +Citronellol. 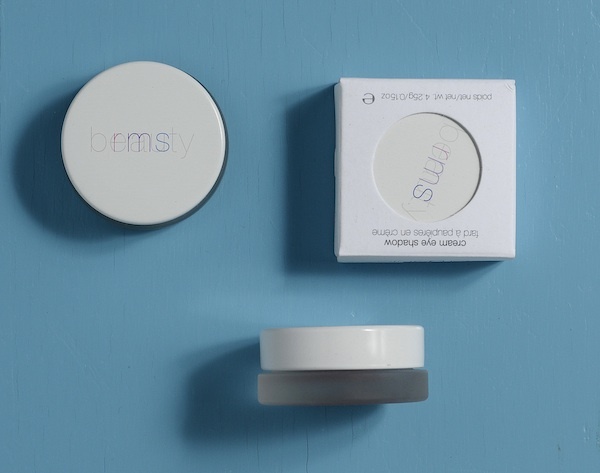 Last but not least comes this amazing product RMS Beauty Loose Tinted ‘Un’ Powder that I wanted to try before in the translucent version but haven’t yet. Finally, I’m glad I tried now the new coloured version, especially because I never tend to use coloured powders. I always use only translucent ones personally and professionally and this one was really a nice discovery! Since I like to wear myself the RMS beauty uncover up in n.11, this powder in the light shade 0-1 is great to wear on top of it. It’s a warm light yellow which is not too dark, nor too light. The perfect subtle hint of colour for those with light and fair skin! Of course you can wear it on other creamy foundations or BB creams as well, that are now so modern. And not to mention the texture which is one of my favourites, since I only love just a couple of powders from natural brands. It’s very finely miled and it’s seamless on the face, but at the same time it gives that perfect satiny finish (and not a cakey, powdery one). It comes in a plastic minimalistic jar, equipped with a powder sponge. You can use it to apply and set the powder instead of a brush. INCI: Silica, Iron Oxides: CI 77492, CI 77491, CI 77499. 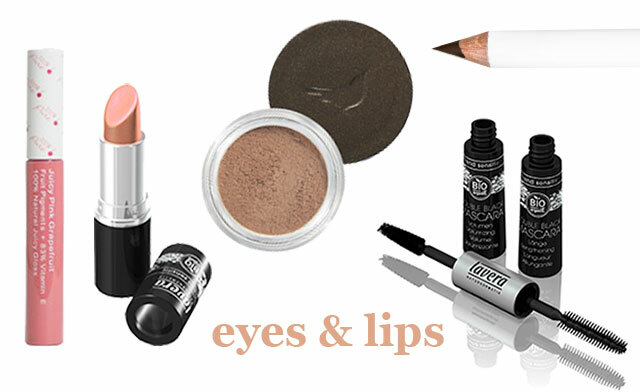 First spring days make you want a healthy look and light textures of makeup. When the first sun rays are shining on your face, you wish to have a radiant and glowing face. At this point, it’s good to know that many times women are confused how to achieve a glowing skin and thus they choose a wrong foundation that is too oily, or they apply too much shiny powders all over the face. The overall result is an oily looking face (like sweating), with no definition and without 3D effect, that the makeup should give to your face. 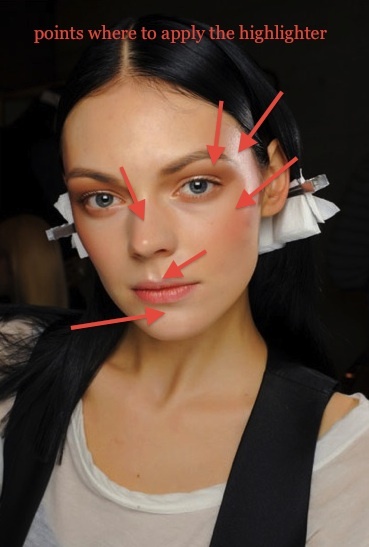 How to apply the highlighter and give the skin the real healthy glow? On the face there are areas that recede and areas that are prominent. They give to our faces the 3D effect that is crucial to understand when doing our makeup, especially when using a highlighter. There are points on the face that catch the light and reflect it. You should apply the highlighter on these areas to get the desired glowing effect, otherwise your face will look evenly covered with a shiny texture without any definition. I’d avoid using highlighter on oily skin. If you really want, use it just on the brow bone and a small amount on the top of the cheeks. You also have to take in consideration the shape of your face. Green makeup tip The new generation of highlighters is a creamy formula and a light texture with light reflective particles. They are perfect to mix them in your foundation, or use them on top of your foundation, or if you have a perfect skin, you can use them alone directly on the skin. 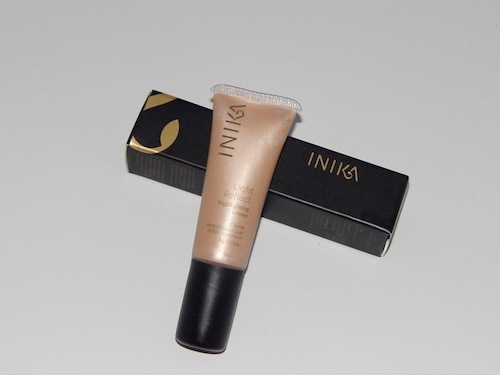 One of my favorite is Inika, a mineral illuminating creamy highlighter. It is packed in a small 8g tube, but a little goes a long way. Its formula is oil-free and it absorbs quickly in the skin, giving it a youthful glow. I especially like the color, a pearly skin beige shade that matches very well almost every skin tone. The ingredients are mineral based and certified vegan, one of the best choices. More details on these products will be presented in one of my next posts. A lot of you may know the awesome RMS beauty line, created by the celebrity makeup artist Rose-Marie Swift. The products are made with the best organic ingredients to provide not just a healthy skin, but even an ultra modern look. For those who don’t know this brand yet or if you already are a RMS addicted, I want to share my excitement with you. 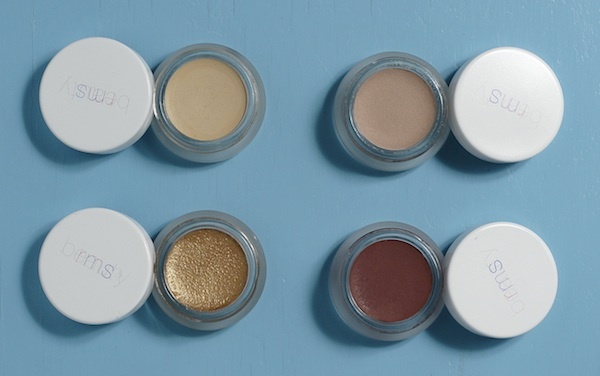 Before trying RMS beauty makeup I was informed about many benefits, high quality and safe ingredients, so it was just a matter of time when I was going to try the products and what the results were going to be. I was especially interested in the concealer/foundation called “Un”cover-up. I’ve chosen the shade n.11, which is the lightest one from the collection. 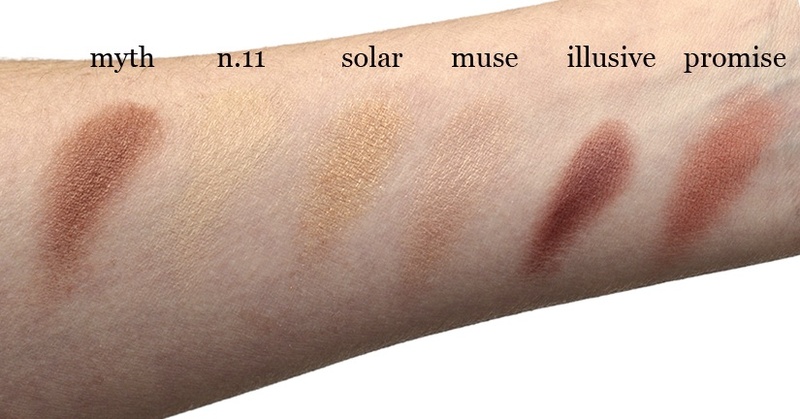 There are also n.22 for medium skin tones and n.33 for dark skin tones. I knew that RMS products are high quality, but honestly, I didn’t expect such a great product. 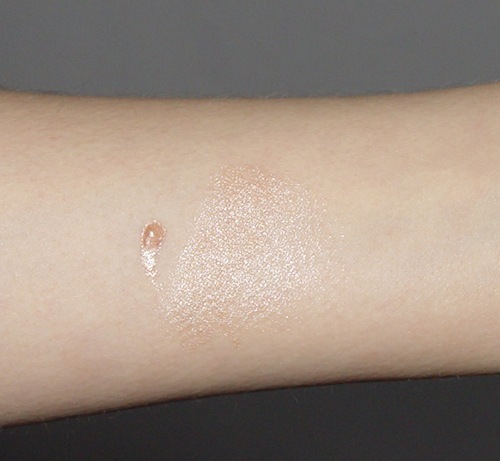 “Un”cover-up can be used as a concealer or as a foundation. The coverage is very good even with the first thin layer of product applied. At the same time it provides a light and dewy texture. The shade n.11 is yellow based and it covers very well any imperfections. In my opinion, the shade of color was wisely chosen by the creators because adapts itself to your skin tone! 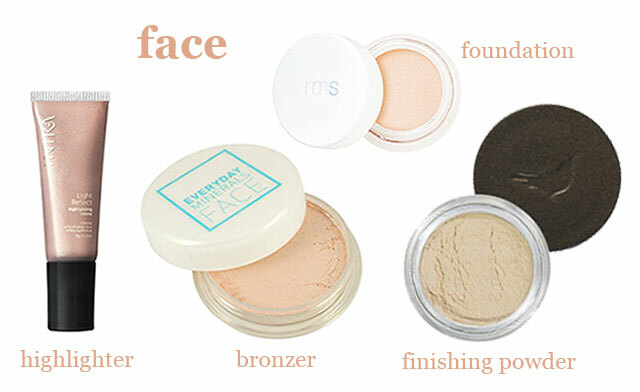 You have to bear in mind that all RMS products are high pigmented, which means you need a small amount of product. The smell is pleasant, natural, non-defined, which is good, especially for sensitive people prone to allergies. I noticed many times that people don’t like certain smells of cosmetic products, such as foundation. The best thing from my point of view is the staying power of all products, especially “Un”cover-up and cream eye shadow hold very well without creasing. They are extremely easy to apply and blend very well. 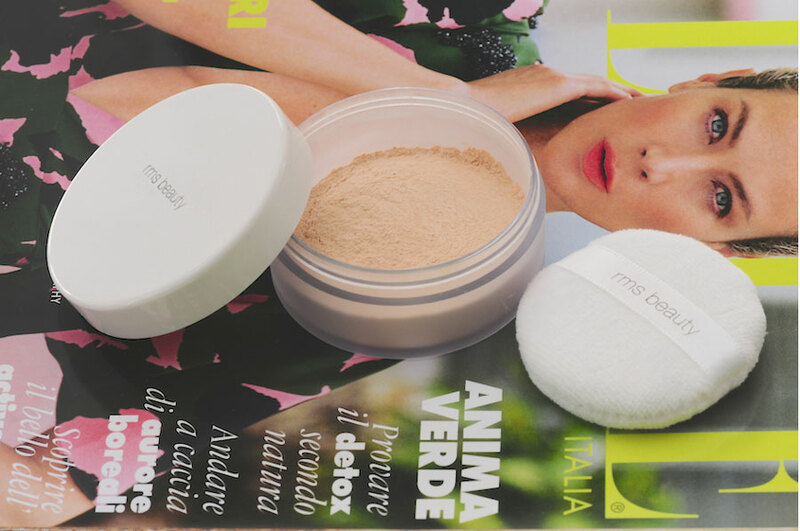 The overall result is a nourished, healthy looking skin, with a perfect texture and a chic modern makeup. Lip2cheek is also the kind of product that I adore professionally and for my personal use; a multi-use product for lips and cheeks. I have tried one shade also on the eyes and the result was amazing. All shades are created and chosen very well, from the lightest to darkest and in tonalities that give you the right touch of fresh color on the face. 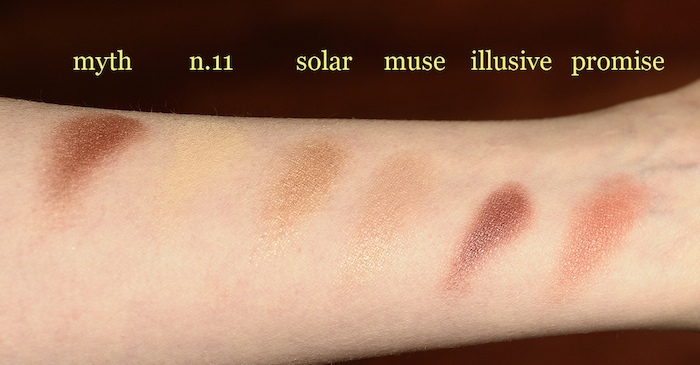 From the Lip2cheek range I’ve chosen Muse, Promise and Illusive. You can see them below on the pictures. I decided to post 2 type of pictures; one in natural day light and the other with flash. I noticed that in day light the colors have a subtle satin shimmer, but not very shimmery at all. Then I have tried them under artificial flash light and the result was quite a lot of light reflecting particles in the product, with a quite shimmery result (excluded “Un”cover-up). There is nothing wrong with that, but if you will use them for photo shooting, pay attention to the light and effect that you desire to achieve. 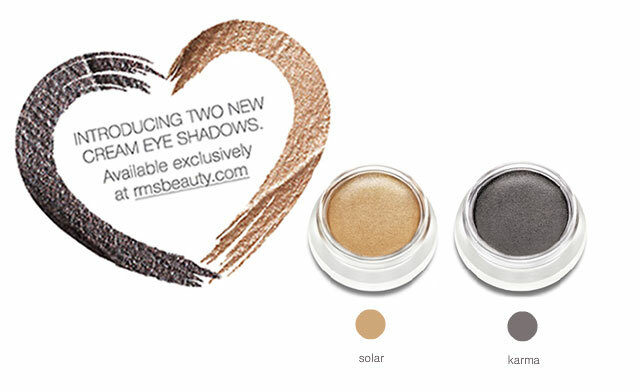 From the Cream eye shadow collection I present Solar and Myth shades, both very unique and multi tasking. 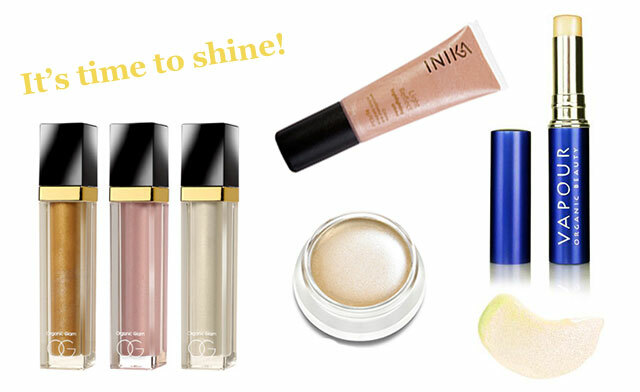 Solar can be mixed in a lipstick if you want a touch of gold, or use it as a highlighter. Myth is great also as a bronzer. As I mentioned before, the staying power and pigmentation of all RMS products, especially those for eyes, are truly awesome. Something that you don’t expect from a cream “green” product. You can achieve a perfect makeup with extra nourishing effect in just a few minutes. The nice thing is that you can use all RMS products as far as your imagination goes. You can be very creative even with a small amount of products if you want! Green makeup tip First, I was a little bit upset because of small package, but then I discovered that they are perfect, because you need the smallest amount of product. The glass jars with stylish tin lids are design masterpieces, that you don’t want to throw away when you finish the product 🙂 You can clean and reuse them. Handy for your makeup bag or for a travel kit! My congratulations also for their effective and excellent service!